First things first: the Frederick Bicycle Coalition is having its annual pot luck picnic this Sunday. If you are free, come on out. Rides will be leaving in the morning, and then a lunch with burgers, veggie dogs, and adult beverages, all served up at the Gambrill State Park Tea Room. There will be rides lead by local singlespeed legend Joe Whitehair, a gravel road ride lead by me, James, a normal non-painful road ride lead by our friend Mike Wali, and a downhill thing lead by Hillary Elgert. Details at FrederickBicycleCoalition.com Here’s the flier, in case you are more of a visual learner. It’s been a while since we’ve had time to write to you, and we’re sorry about that. We’re going through a transition at the shop, with John Harrison leaving to make loads more money, and John S. leaving Sundays to go race ‘cross for the season. We wish them both loads of luck with those things! John H’s wife made us a cake for his last day at the shop. She works at Charm City Cakes, which is the place to go if you want a delicious and really good looking custom cake. They are like the Bike Doctor of the cake world. Here’s a pic, in case you missed it on facebook. 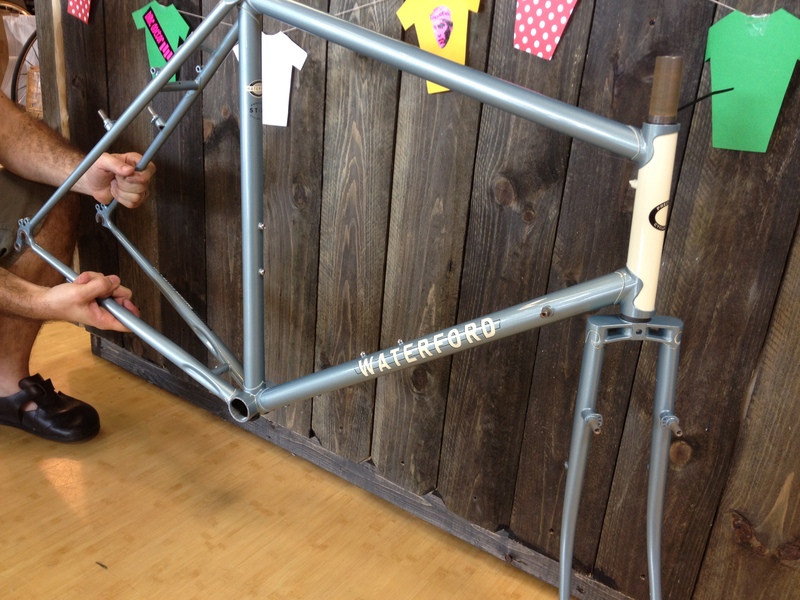 John H’s 650b lugged Waterford. He had a special fork crown brazed on. The frame can clear huge 44mm tires and fenders, so it’s made for some hard riding! 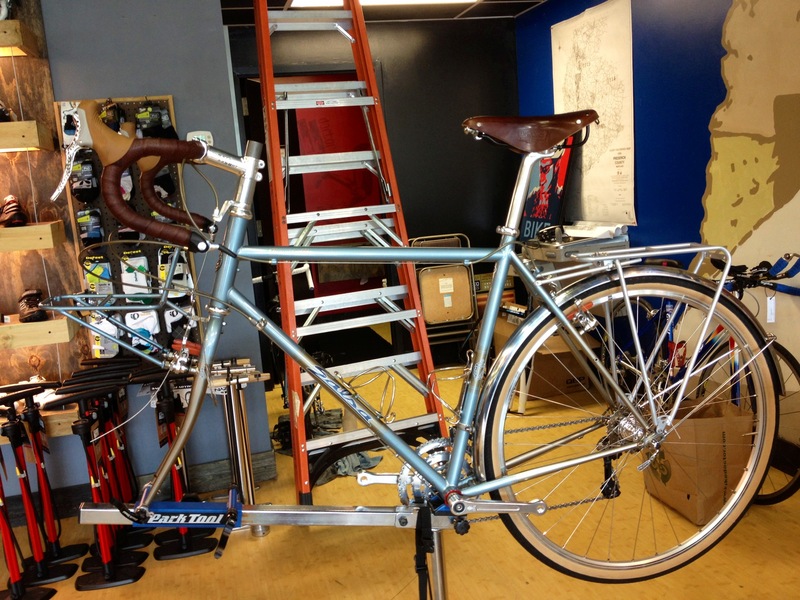 Speaking of custom, we’ve had a few custom builds roll through the shop recently. We need to get way better at documenting them, because they all look great. Here’s a few shots, apologies for quality of image, some are better than others! 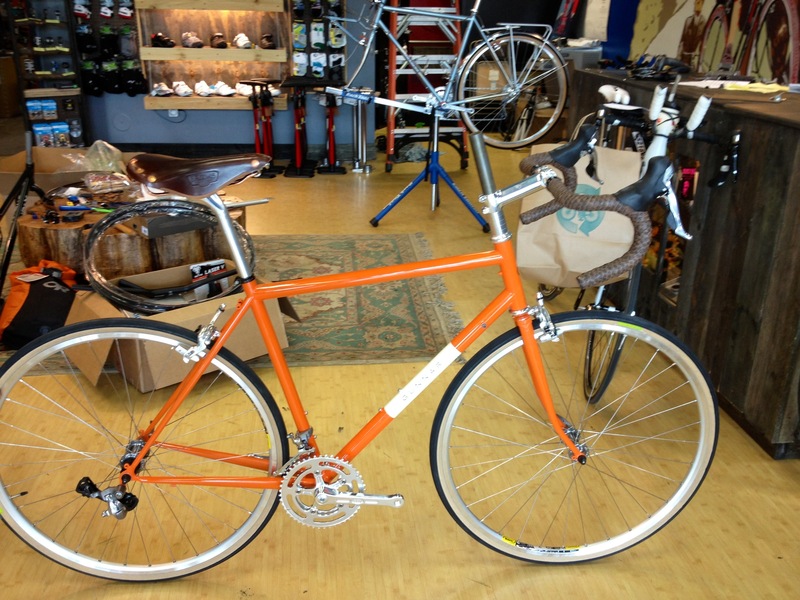 Dan the Elder build up this custom Cannondale CAAD 10 w/ Bike Doctor’s 2012 paint scheme. A super light alloy frame mated to a full carbon fork. He went with SRAM Rival bits for the drivetrain, and some rad 3T cockpit parts. Fizik saddle and Ultegra pedals round out the package. He already had a few touringish bikes, and this guy satisfies his need for speed. Mike P was sick of beating the snot out of his Dual Suspension bike. So he got all punk rock minimalist and had us put this Karate Monkey together for him. One gear. No suspension. Fat tires at a low pressure, and big old bars to muscle up the hills. 24 lbs of tough steel love. We handbuilt the wheels and spec’d only tough stuff through out. He’s trying tubeless for the first time, and we think he’ll dig it! Dico wanted light, unique and tough. Brian spec’d out this ode to minimalist excess in the form of a Custom Seven Singlespeed Frame with a Whiskey full carbon fork. I9 wheels round out the package. This thing is a one gear rocket. Seven, for the record, offers a variety of Ti frame options, and does a good tig welded steel frame as well. Gregg S’s Salsa Casseroll. Gregg wanted a good gravel road bike for some light touring. miles of very happy cycling.” That’s what we like to hear, Gregg! Here is a blurry pic of our not yet complete Gunnar Sport. This guy will clear 26mm tires and fenders or 32 mm tires w/o fenders. 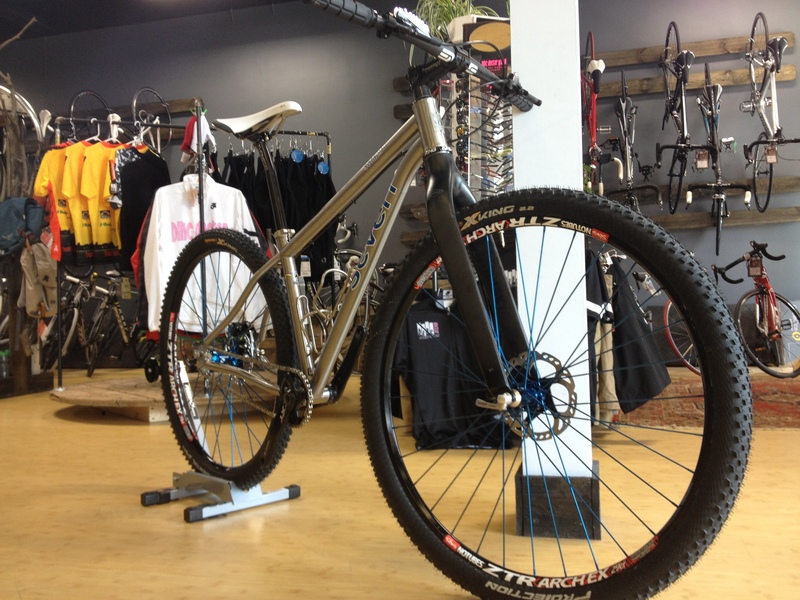 We built it up using handbuilt by Zach wheels, 105 shifters and mechs, and a pretty retro styled front crank. 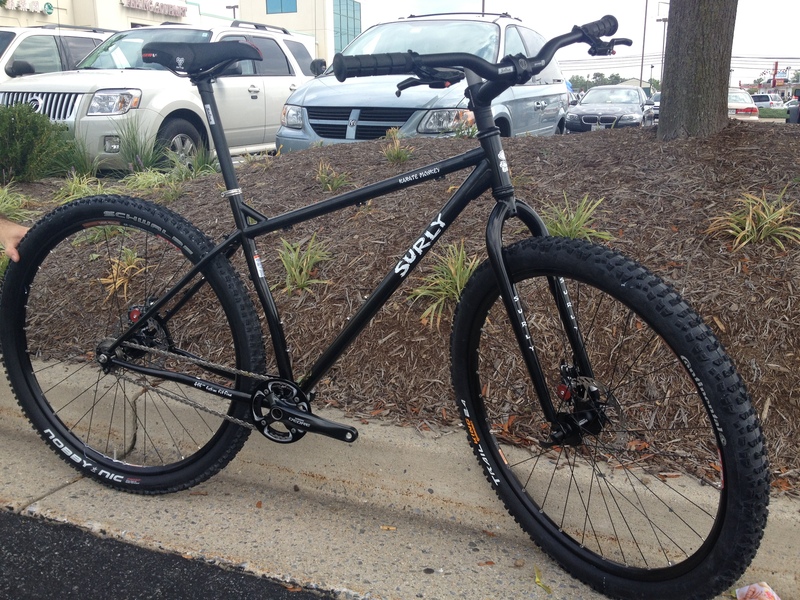 Brooks saddle of course… This gravel monster will be ready to demo really soon, so come sign up. There are at least 3 more of these guys, including Mark S’s heavily modified Madone pass hunting bike, that will have to wait for the next post, because I am outta time! Upcoming group rides: Frederick Bicycle Coalition Picnic rides on Sunday mean there are no group rides Sunday, besides that one. Wednesday: Hill ride with Brian. Meet at the shop around 5, wheels down at 5.30 in the evening. Fast (but not insane fast) road ride up into the mountains, back down again, back up again, and down again. Back before dark but bring a rear blinkie in case of mechanicals. Thursday meet the Team Flying Dog guys and Brian for a spin through the Frederick Watershed. The ride is hard, but the pace is taylored to attendees, and they won’t cook you unless you want it. Meet at the Maintenance shed at the foot of the dirt part of Mountaindale Road. Wheels down at 5.30. Additional notes… are you even still reading this? We will be resuming our clinics soonish, but right now we are still way too busy. What are you looking for in clinics? let us know via comments! Do you have a story you want to submit to the blog? Send it to us at bikedrfrederick (at) gmail (dot) com. We’d love to see it. Pictures with stories help! bike adventure, Bike Advocacy, Bike Doctor Frederick Shop Rides, bike doctor in the world at large, clinics/shop events, Dirt Road Riding, Frederick Bicycle Coalition, Frederick Pedalers, Frederick Riding, Lots of Pictures for the Illiterati, new rad stuff, Pass Hunting, Posts that start with the letter P, Things you should be into, what's your epic?